AT&T Collaborate includes several pre-built integrations with apps such as Salesforce®, JIRA®, Marketo®, and Zendesk®. You can also create your own custom integration for another application. In the panel on the left, click the Settings icon . Click Manage Integrations. 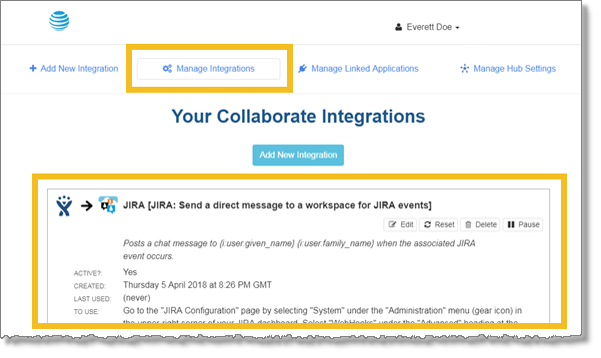 The Collaborate Integrations window opens, showing the list of available integrations. Click the integration you want to add. Select the action you want the integration to take. From the Organization list, select your organization. If available, from the Workspace list, select the workspace you want the action to apply to. If available, from the User list, select the user the action applies to. From the Organization list, select your organization (if available). 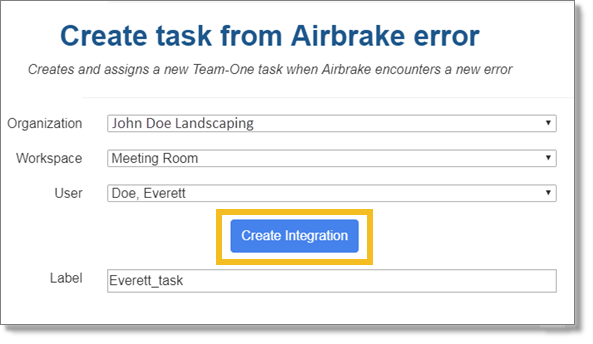 From the Workspace list, select the workspace you want the integration for (if available). In the Target URL field, enter the IRL to invoke when the integration is triggered. From the HTTP Method list, select the HTTP method to use. In the panel on the left, click the Settings icon . The Settings window appears. Click Manage Integrations. The integrations window opens. Click Manage Integrations. A list of your integrations appears.